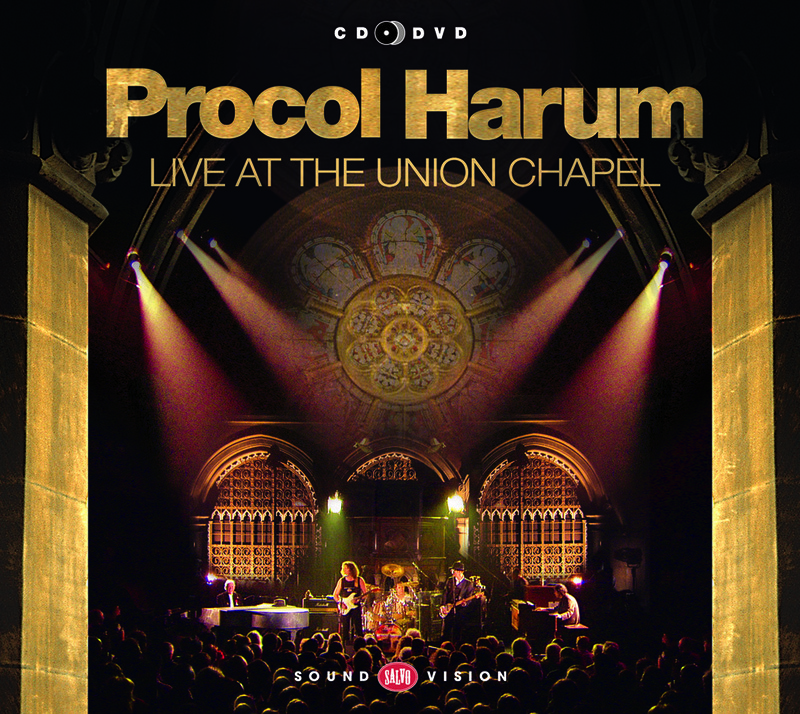 When Procol Harum recorded their Union Chapel DVD ten years ago it was intended, in Gary Brooker’s words, as ‘a substitute for a live show’ in ‘places that we’re not going to play’. 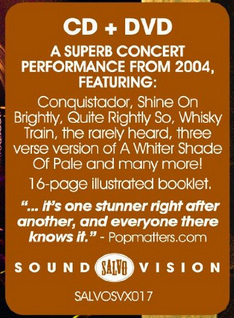 Not that live appearances by his normally-elusive ensemble had been lacking in 2003: this Islington gig was the climax of a world tour promoting Procol’s new album, The Well’s on Fire, and the band was at its exceptional best. Almost thirty years before, John Peel had likened Procol Harum to ‘a huge engine cruising’: tonight it was returning home with nine months’ accumulated momentum. The DVD also functioned as a marvellous ‘souvenir of London’ for lucky fans who had been present: it reveals far more than any one concert-goer could ever notice in the flesh. Using just half-a-dozen cameras, it captures the warm atmosphere of that winter evening with unobtrusive subtlety: the filming, according to web critic Lawrence Devoe, is ‘beyond reproach’. From a 2013 perspective the DVD has a different rôle again, documenting the final public show from a classic incarnation of this Protean outfit, also its longest-lasting. When The Well’s on Fire line-up – Gary Brooker (voice and piano), Mark Brzezicki (drums), Matthew Fisher (Hammond organ), Matt Pegg (bass) and Geoff Whitehorn (guitar) – finally made a record, they’d already been together a decade. They’d outlasted the whole ‘first career’ of Procol Harum which – following a 1967 début with the worldwide hit A Whiter Shade of Pale – had spawned nine studio albums cut by a gradually-evolving crew of musicians. Such accolades were surely foreseen by Procol’s enterprising manager, Chris Cooke, when he persuaded the band’s then record-label to film this London homecoming. The ecclesiastical setting perfectly complements music described by Classic Rock as ‘sombre, beguiling’. Procol’s sole concession to the cameras is their closer-than-usual grouping underneath the arches. There’s scant posing or pretension: the faux grand (built in San Francisco, for Procol’s 1991 return to touring, by their former equipment-man Barry Sinclair) clearly reveals Brooker’s RD600 digital piano inside; the stage toys, tongue-in-cheek manifestations of various Keith Reid song-images, are transit-lounge kitsch; even Geoff’s occasional grins and grimaces seem unaffected, compared with the histrionic gurning of many guitar heroes. The filming bring us close to Whitehorn’s bends and bi-manual wizardry, Fisher’s deft glissandi, Brzezicki’s nimble precision. Everywhere we see understatement (‘restrained power is more exciting than vulgar demonstration’ – Peel again). ‘We were pretty loose and strangely together,’ Geoff remembers; and a surging undertow propels even the most majestic songs. Interestingly the tempi here are often a couple of beats-per-minute faster than the studio originals, whereas at Procol’s latest UK outing (Hallowe’en, 2010) they typically played slower than the recordings by a similar factor. Appraising this show online at TechnologyTell, Mark Smotroff speaks of ‘middle-aged guys playing great music really well’. Middle-aged or not, Procol Harum owes its vibrant longevity to the calibre of instrumentalists attracted by occasional vacancies, and their notable individuality (spot the heterogeneous stage-wear!). Nattily-dressed Matt Pegg brings the youngest blood to the band, as well as an impeccable bassist’s pedigree: on coming aboard in 1993 he was only 22. When Chris Beaumont, at Blogcritics.com, comments that Procol’s musicians are ‘serving the song rather than any musical ego-trip’, one thinks of Matt’s tasteful underpinning in particular (and how his fine Old English Dream break is one nuance the camera-team didn’t manage to capture). Next comes Mark Brzezicki (born 1957), previously drummer with Big Country, and claimed back by that band’s twenty-fifth anniversary tour, after Procol’s sparkling Live at Ledreborg DVD (filmed in 2006 outside a Danish castle, with choir, orchestra, and 13,000 fans). Mark already knew the Union Chapel from Procol’s promotional video-shoot in 1991 (alongside Brooker – who likened it to playing ‘in the middle of a kaleidoscope’ – and Fisher). His impassioned drumming galvanises the habitually-gentle Quite Rightly So, a highlight of the present DVD. Geoff Whitehorn (1951), Procol’s longest-serving fretman, pays occasional homage to his predecessors (the sinuous Robin Trower lines in Simple Sister, for example), and conquers new territory with his contemporary techniques on Strat and Les Paul copies (by Fret King and Sid Poole respectively). He’s a virtuosic improviser: listen for his Layla call-and-response with Matthew Fisher (who also sports ‘a good pair of ear-holes’, as Geoff acknowledges). Fisher (1946) played Hammond organ on Procol’s first three and last two studio albums, equally at home in Procol’s high Gothic style – as exemplified here by Weisselklenzenacht – or in the three-chord simplicity of a tune like The Question (although he starts this live version with a slice of Rachmaninov – mischief at odds with his impassive stage demeanour). Fisher and Brooker’s eclectic listening came out in the afternoon’s soundcheck, as they touched on the Hallelujah Chorus, Saint-Saëns’s Organ Symphony, Widor’s Toccata, and some Wohltemperierte Klaviering, along with seasonal carols and Down at the Old Bull and Bush. As recently as 2012 Matthew – now a software designer – spoke to journalist Dmitri Epstein about the ‘musical chemistry between me and Gary’. The intriguing little Underture, which starts this DVD, not only encapsulates Procol’s continuity of style – by dovetailing 1967's Repent Walpurgis and 2003's The Emperor's New Clothes – but also represents the shared heritage of Fisher and Brooker, their respective originators. Yet whereas Hugh Fielder’s Classic Rock review characterises ‘the two surviving founders … like an old married couple they tolerate each other's foibles, well aware that they are indispensable to each other,’ hindsight tells another story – given Fisher’s High Court pursuit of writing-credit for A Whiter Shade of Pale, and the band’s ongoing success without him. Gary ‘inhabits the moment’ onstage, as his hilarious and perplexing inter-song banter (much-edited for DVD-purposes) attests. He announces the 1967 single, Homburg, as ‘one of our old ones’, as if the foregoing item, 1973’s Grand Hotel, somehow belonged to the modern day. Minor lyrical mix-ups – a sign of age in some singers – have peppered his performing from the outset. Yet his full-throated hollering, in the throwaway Every Dog, epitomises total commitment, though the renowned larynx has already been taxed by a memorably long day. Following Conquistador’s standing ovation, fans hear The Commander introduced for the first time as ‘Gary Brooker MBE’ (the decoration on his lapel, recognising musical charity fundraising, was bestowed at Buckingham Palace that very morning – no lie-in for this band-leader, despite a night’s live recording in prospect). Delighted fans are treated to an extra Whiter Shade verse, rarely-aired ‘not because we don’t like it … but we have so much material to play that sometimes you could use that minute-and-a-half elsewhere’. And he would have played on. Of the soundcheck’s eleven Procol tunes, a mere four had made the setlist; fans who’d overheard two sections of In Held ’Twas in I before the concert were cheering for that eighteen-minute masterpiece. But the cameras show Chris Cooke urging caution, to forestall an expensive curfew violation: so Gary just leads his congregation through Swing Low, Sweet Chariot, the unofficial Rugby Union anthem, as sung earlier in the day by an immense Trafalgar Square crowd as England’s World-Cup winners made their own proud way to The Palace. This unexpected finale – accompanied by organ, and the frontmen’s cheeky gestures – did not make the DVD. Also lost in the edit-suite are God Save the Queen, prefacing Grand Hotel; Wizard Man, probably rendered unfilmable when we got up to ‘wiggle our bums’ at Gary’s invitation (‘I’m sure the Lord won’t mind’); and a rousing Beyond the Pale, played to acknowledge ‘a couple of friends of ours, who run our website’. Those friends – the www.procolharum.com team – hosted a curry supper for performers and guests at the end of this magnificent evening. Like his musical colleagues Gary Brooker was, in his own words, ‘still going at two in the morning: the whole day kind of built and built …’. Many fans around that table had followed the band from its earliest public notes in 1967. That gilded summer, when Procol ruled the airwaves, we might well have predicted triumphant London shows in the following century, but the fantasy had faded by 1977’s Summer of Hate, when the Old Harum ran aground, exhausted, in a sea of punk. Though the 1991 relaunch resurrected fans’ dreams, I’m not sure anyone in 2003 dared suppose that Live at the Union Chapel would precede ten further years of Procol action: 136 shows to date, covering seventeen countries; three downloadable live albums from another cracking line-up (Josh Phillips on Hammond, Geoff Dunn on drums); and collaborations, to terrific acclaim, with high-profile choirs and orchestras in Canada, America, Denmark and Germany. Even as I write, there are new gigs on the horizon. Such, then, are the continuing voyages of the legendary ship Procol Harum: ‘your witness, my own hand’.